portrays the feeling of looking into the night sky on a cold, crisp evening to find the North Star. The piece opens with a sparse opening the builds in intensity, just like the stars coming out as night descends. The flutes give us the sound of the night breeze with wind sounds on the held notes. 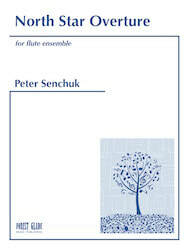 As it progresses the music increases in tempo and becomes an energetic piece with joyful flourishes for all the flutes.